I'm probably never going to spend $75k on a car...but if I did, it wouldn't be on an poorly resprayed 1970 Porsche 911S , or a 1967 VW Samba Bus ....no sir. It will probably be when I'm much older and closer to death, which ironically will be even closer if I did buy this thing. Find this 1973 DeTomaso Pantera 533ci Big Block here on eBay currently bidding for $55,100 reserve-not-met and $75,000 buy-it-now in Mill Valley, CA v. Tip from Kaibeezy. 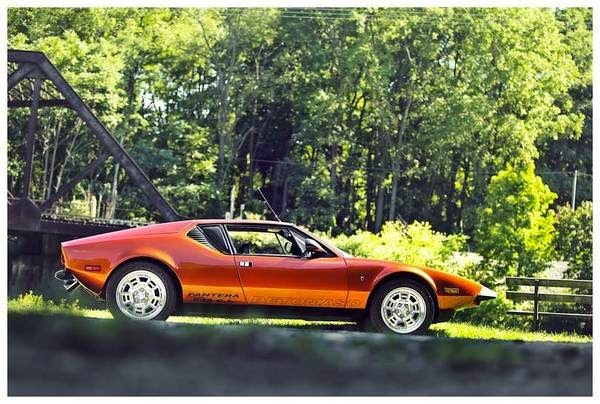 The Pantera was designed by Tom Tjaarda of Carrozzeria Ghia who penned such beauties as the Type 34 Karmann Ghia, Ferrari 330GT 2+2, Ferrari 365 GT California, Fiat 124 Spider, Ford Maverick, Laforza Magnum 4X4, & Saab 900 Sedan. It used a steel unibody design with a mid mounted Ford V8 and approximately 7000 were produced from 1971-1992. When new, the Pantera was sold through Ford's Lincoln/Mercury dealers and was powered by a 351 cubic inch Cleveland V8. This one is now powered by a 533 cubic inch version of Ford's 460 V8 that has ever manner of customized part bolted on and in it. The transmission is a ZF 5-speed that is rated at 800 horsepower according to the seller, which it might need to be given the potential of that engine. The wheels alone are gorgeous. second best wheels ever, imho - we had a coffee brake on this topic last year, got 12 comments - how many do you thinK it would get if we did it again? You would probably get hundreds. Or maybe only 12 again, if we all agreed. I don't agree - to anything, including agreeing. That I don't agree to. Still just about the prettiest supercar ever. 180 headers? Now it's worth it! On one hand, an aluminum-head 460 probably doesn't weigh any more than the stock all-iron 351C. On the other, guys are getting vast HP out of the 400ci Clevelands in Pantera applications these days. All this car does is remind me how creaky my bones are these days. The last Pantera concert I went to was 30 years ago and now I'm too old to go to another. Thanks a lot for reminding me. You can go to another, hopefully not just beyond the Cemetery Gates, though. +1. I always liked the Cowboys From Hell album. And yes, I said album...I have it on vinyl. And I listen to it on a turntable! But I'm not one of these hipster lame-os that bought it that way because "it sounds better". Nice car, but what is it doing here? I recall something about "the internet's best... for less than $20K". I've always been terrible at math, but I think 75 is more than 20. All I'm saying is stay on point. Anonymous, you have a point about staying on point. But my vote would be that the $20K rule should be chucked out that window at random and with no other purpose other than to free all of us from it. This Pantera is a good example of what I'd consider a "Rich Man's Toy" and I'm not particularly interested in it. But I just do what a lot of folks do - just skip it. But I'd rather see this sort of thing pop up occasionally than be rigid with the parameters. Life is too short to worry about such things. In fact, I vote for getting rid of the "...on the road for less than $20K." part of the tagline entirely. Who is with me!?! Kaibeezy, did you pick up a ghijak while you were there? Rumor is, he did get the ghijak while he was there, but the doc prescribed some penicillin and now the rash is gone. You just made my head hurt. I don't understand Klingon but I get the drift...cold...revenge...yeah, I had to look it up. I'm more of a Browncoat, myself. Rocks and glass houses, you say? This is just across the GGB from me. Happy to do a PPI & test drive for ANYONE with even a passing interest in this beautiful beast. These look sooo cool in pictures, but are sooo disappointing when you see them in person. I mean, they even have worse fit and finish than a C3 Corvette (yes, that's actually possible). Yes, these cars will kill you, if you're not careful. One of them killed hockey legend and posthumous Canadian donut-shop king, Tim Horton.